Throughout her career, Indiana Fever forward Tamika Catchings gave the world profound style of gameplay that is immortalized in the records she set and the achievements she has earned. Her efforts with the Fever were a catalyst to help others through her foundation ‘Catch the Stars’ and her presidency in the WNBPA. The Fever lost to the Phoenix Mercury 78-89 in the first round of the WNBA finals. This match up was the final game for the 15-year veteran forward. 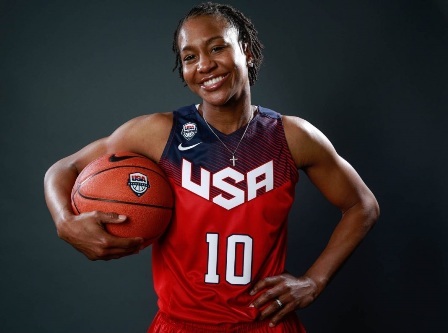 In August, Catchings competed in her fourth Olympic games where the USA women’s basketball team won gold medal honors. The Catch the Stars Foundation emphasizes the importance of reading, mentoring, and physical health. The Indiana forward established the foundation in 2004. “A passion of mine is youth and just giving back towards the community,”she said. Catchings spent her whole career with the Fever, making her one of the few pro athletes to stay on one team for their entire career. She accumulated 7,380 career points and came into the 2016 season as the no. 2 scorer in the WNBA. The legacy that Catchings leaves is filled with defensive aggression and offensive accuracy, a level of talent that led her to play in 10 WNBA All-Star games. Born in Stratford, New Jersey, Catchings attended Duncanville High School in Texas. She is the first athlete to make a quintuple double, a feat she executed in her high school days in 1997. Catchings joined the Tennessee Lady Vols, under the tutelage of the late Pat Summitt. The Lady Vols had a 39-0 record and went to the national championship. In 2000, she became the Naismith player of the year. After graduating from the University of Tennessee in 2001, she was the third overall pick in the WNBA Draft, acquired by the Indiana Fever. With her, the Fever went to the playoffs 12 times; Catchings played in every playoff game in the history of the franchise. In 2012, the Fever won the WNBA championship. During that season, Catchings scored 17.4 points per game, shot at 43 percent in field goals, and 86 percent in free throws. In the playoffs, she averaged 19 points per game and eight rebounds per game. The Olympic stage also featured Catchings’ talents in her debut at the 2004 Athens Olympics, culminating with a gold medal. She is one of the few American basketball players to receive four Olympic gold medals. “It’s been a lot of fun just to play with the players that I had an opportunity to play with,” Catchings said.